Planning and constructing an off-site library shelving facility requires a great deal of time, effort, and expertise. We’ve outlined some of the basics here, but be sure to check in with your local Spacesaver distributor to take advantage of their knowledge and experience. 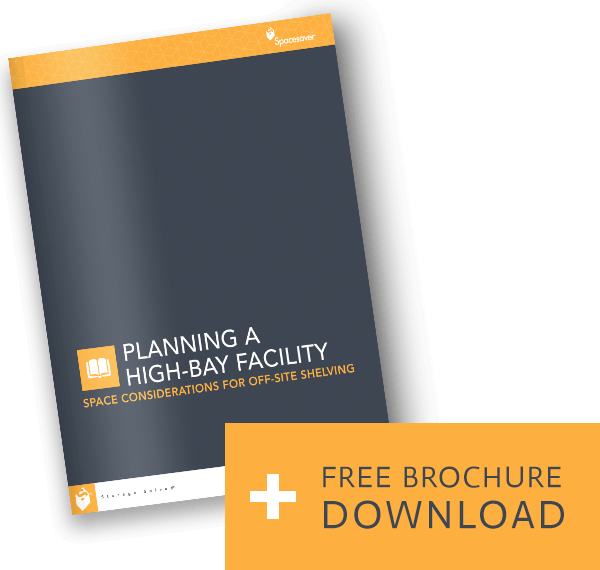 Download Spacesaver’s Planning a High-Bay Facility to find additional planning considerations and learn about the University of Wisconsin-Madison’s strategy for managing the move to an off-site shelving facility. The high cost of on-campus real estate often requires off-site facilities to be located in older buildings or in new facilities on the city’s outskirts. Due to the tremendous weight load of books, shelving and retrieval equipment, soil tests and structural tests are required to ensure that the site can bear the load. Many project planners and librarians are choosing to store volumes in boxes by size rather than by subject. Since all volumes and boxes are barcoded, volumes can be easily located in the high bay shelving system, no matter where they’re stored. Also be sure to create storage space for trays, boxes, and other supplies. To meet preservation standards, it’s necessary to maintain proper humidity, temperature, and ventilation. Because HVAC systems take up a substantial amount of space, be sure to account for the placement of vents, fans, and other components that could potentially obstruct storage systems. A high-bay shelving facility is not a warehouse. It’s important to plan for the wide variety of functions that will be performed in the facility. Put project vendors in touch with the architect or general contractor early in the planning phase, well before construction begins. Experienced vendors will bring useful insights and can help ensure that all components are accounted for in the plans and drawings. 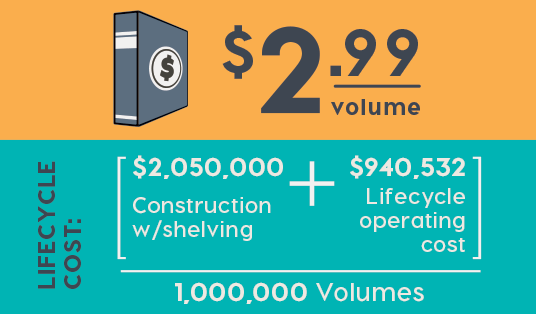 The Lifecycle Cost per Volume, which measures the costs of storing a single volume over a period of time (i.e., 20 years), while factoring in the costs of real estate, construction, and on-going operations. A high-bay shelving system makes maximum use of vertical space. Shelving can be easily adjusted based on book size or box type to condense collections. A smaller facility can be built when a high-bay system is compacted to eliminate empty aisle space. This results in decreased operational costs. When the same facility is filled with items stored on a mobile system, more volumes can be stored. The items remain accessible and organized while significant capacity is gained. Spacesaver was really a key player in our planning. 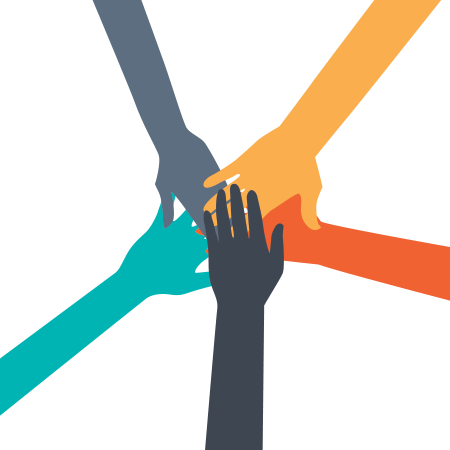 Consolidating the contents of a library network requires a deliberate plan of action. In fact, some of our clients have found that planning the move to a high-bay facility can take longer than planning the facility itself. Consider these factors to help determine which volumes should be given priority in the move to off-site storage. Analyzing circulation numbers, gate counts, shelving space, staffing levels, and the square footage of various library spaces helps build an understanding of how spaces and materials are being used. While some faculty and staff eagerly anticipate consolidation and are ready to move their collections, others are more resistant to change. Consider the feasibility of repurposing various areas, as well as those areas’ capability for supporting modern teaching and research functions. It makes more sense to move a collection when there’s a pressing need for on-campus space. Some collections are housed in purpose-built storage areas or are otherwise not good candidates for moving off site. It might be best to leave these collections where they are. 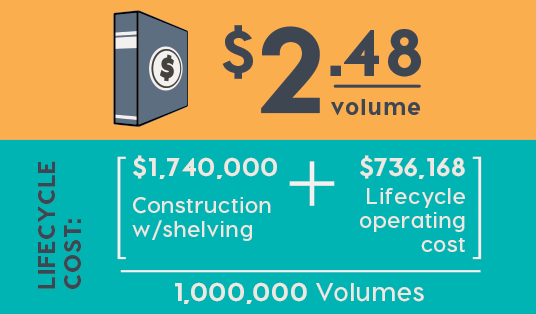 For decades, Spacesaver has been a trusted partner in helping architects, planners, administrators, and library professionals successfully design and implement offsite shelving facilities. Your local Spacesaver distributor can provide you with space planning services, product installation, and long-term service and maintenance by factory-certified technicians.